Friday News Roundup: Busy Week for RIM! A Friday morning recap of some of the things going on in the world of RIM/BlackBerry this week. Headlines after the Jump! 1. Rogers 8310 Launches - That's right, RIM gave the Canadians a GPS-enabled Curve before those living South of the Border. Available as of September 11th. 2. Built for BlackBerry - RIM launched a Built for BlackBerry website (though it's built for your PC). Nice looking little site, with some links to berry-worthy applications. It's no CrackBerry.com, but it ain't bad. Check it out. 3. 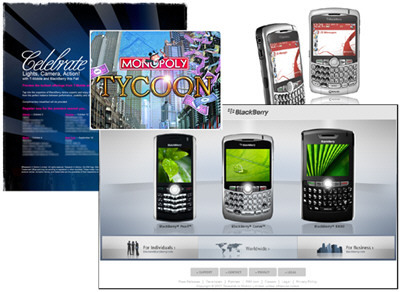 Free Monopoly Tycoon - RIM wants more members in it's BlackBerry Lounge, so they offered a Free Copy of Monopoly Tycoon to the first 10,000 members. Going, Going, get there quick before it's gone. When you're bored of lounging around, come back to CrackBerry.com. 4. T-Mobile BlackBerry Launch Event - Starting September 18th in New York, Research in Motion and T-Mobile will be holding launch events for the release of their new BlackBerry products in big cities across the U.S. of good 'ole A. 5. MTS AllStream Launches 8830 - Yup, My home province of Manitoba has launched the CDMA based BlackBerry 8830. I'm on Rogers now, but I spent more on my MTS cell phone bills for the better part of a decade than I did on University tuition fees. If they gave me a free 8830 I might consider switching back. 6. New BlackBerry.com Homepage - Just launched this morning, there's some new lipstick to the BlackBerry.com homepage. The rest of the site is the same, but looks like RIM is working hard this to weejk to pick up their online game. Good work Boys & Girls! I'm sure there's more to come. Check it! For More Stories, Check Out the CrackBerry Blogs & Forums!